Sri Lanka is a habitat to a fascinating range of fauna species with exclusively having the two largest mammals in the world: Elephants and Blue Whales. With the presence of these enticingly huge species Sri Lanka has topped the chart of the best places for wild safaris in the world. Day 1: Sinharaja Rain Forest. Enjoy a splendid Stay at Rainforest Eco-Lodge for the night. A warming welcome on arrival. Transfer to Sinharaja Forest for day excursion. Explore the surroundings with the setting sun at the backdrop in the evening. Day 2: Sinharaja Rain Forest. Enjoy a splendid Stay at Rainforest Eco-Lodge for the night. 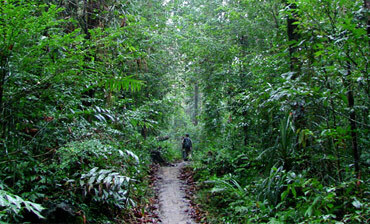 Explore the emerald trails of Sinharaja Rain Forest post breakfast. Sinharaja Rain Forest is Sri Lanka’s last remaining rainforest which houses some ancient avifauna species of the island. Day 3: Mirissa Beach. A splendid stay at Paradise Beach Club for the night. Relish the breakfast in the morning. Move on to Mirissa. Spend a relaxing evening at the club. Day 4: Sinharaja Forest. A splendid stay at Blue Magpie Resort for the night. Leave the resort early morning and move to Mirissa harbor for whale spotting. Gain some knowledge about which and where to spot the whales and dolphins from the fishermen. Other species are fairly common to spot at the harbor. Return to the harbor post-lunch. Transfer to resort. Day 5: Whale Watching. A splendid stay at Paradise Beach Club for the night. Go on board and grab another chance to witness the giants of the ocean for those who loved the whale spotting and for those too who didn’t get the chance to spot the giants in the first chance. Day 6: Udawalawe National Park. A splendid stay at Udawalawe National Park Campsite for the night. Grab a final chance for whale excursion on a different site prior transferring to Udawalawe. After reaching Udawalawe get to know your camp crew and then move on to an exciting safari prior sunset. Day 7: Udawalawe National Park. A splendid stay at Udawalawe National Park Campsite for the night. 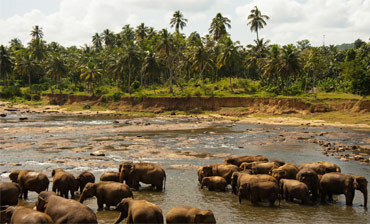 Enjoy the exhilarating game drives at the Udawalawe National Park. Day 8: Udawalawe National Park. A splendid stay at Udawalawe National Park Campsite for the night. 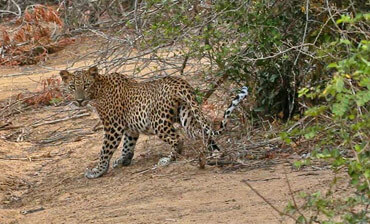 Travel to Yala National Park for the best Leopard experience in Sri Lanka. Day 9–11: Yala National Park. A splendid stay at Yala National Park Campsite for the night. Enjoy a charming morning with savory breakfast. Have a lovely Afternoon with game drives at the Yala National Park. Day 12: Katunayake. A splendid stay at Tamarind Tree for the night. Enjoy the leisure time while exploring the splendor of nature. Grab a chance to indulge in for some shopping.